Hey, fellows! 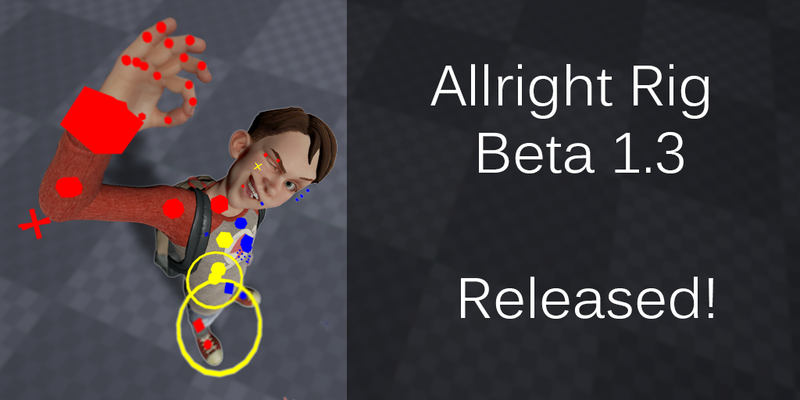 I am happy to introduce you to the last free beta version of Allright Rig plugin! I am very sorry for being quiet for a long time and maybe not answering to all your questions. The reason is that last month I was super busy because of starting of a big project and I just became a father. From this moment Allright Rig will continue developing on full length animation movie that will be made using Unreal Engine 4. I am absolutely sure that this step is necessary for not only the development of the rigging system, but also to extend the editor to work with large scale animation projects. I am happy to see that Epic Games has started to make their own rigging system and more other good stuff for animation. The difference between games and movies disappearing pretty fast and I believe that we are a witness to a huge step of the CG industry evolution. I can’t tell the exact date of when the full plugin version will be released on market place, but I hope it will be this summer. I promise, that the price will be absolutely fair. And of course, those people who supported me by buying my raw system at the first stage, and who did not take the money back after I made the beta free, will get full release for free. Now you can bake blended skeletal animation sections from sequencer right into the rig. Command bakes animation form start to end sequencers playback range. And of course you can save this animation to a new animation asset. Unfortunately, you can not bake animation cycles right now. I added more properties to easily set all fingers rotations . This properties rotate controllers groups, so you can adjust each finger controller rotation as well. Enable Fk Ik Auto Snap property to switch auto snap mode. Now you can copy sequencer transform section animation from one actor to another. Enable Mirror property and set Mirror Axis to mirror pasted animation. You can also use Shift Anim property to shift pasted animation. Set Curve Type to location, rotation or scale and specify Axis. In future there will be ability to mirror any type of animation curves. I am happy to introduce you animation constraints. Now you have same possibilities of constraints as in other animation programs. Select targets and last select actor to apply constraint to. Use W1/2.. properties to specify weight of each target. Right now you cant use more than 5 targets, but there will be no limitations in future. Offset vector sets offset from resulting position. Rest Position property is used to specify position of actor when all weights are 0. Point constraint attaches actor translation to target positions. Orient constraint attaches actor rotations to target rotations. Scale constraint attaches actor scale to targets scale. Parent constraint attaches actor transform to target transforms. In parent constraint each target has its own transform offset. Aim constraint aims actor to target positions. First axis represents front axis of actor, that will actually look on target. Second axis represents axis that will look on Up Actor or Up Vector. Using Aim/Up Invert properties you can flip first or second axis. Up Actor can be set in AnimTools window before creation. During creation constraint will automatically pick closest axis to the target and to up vector/actor and set offset which will not be greater then 90 degrees. This algorithm gives the most accurate work of aim constraint. Set Actor Class and Hide or Select all actors of this class in scene. Use Rotate Relative rotator to add relative rotation to selected actors.